This is Part 3 in a series. Read Part 1 here. 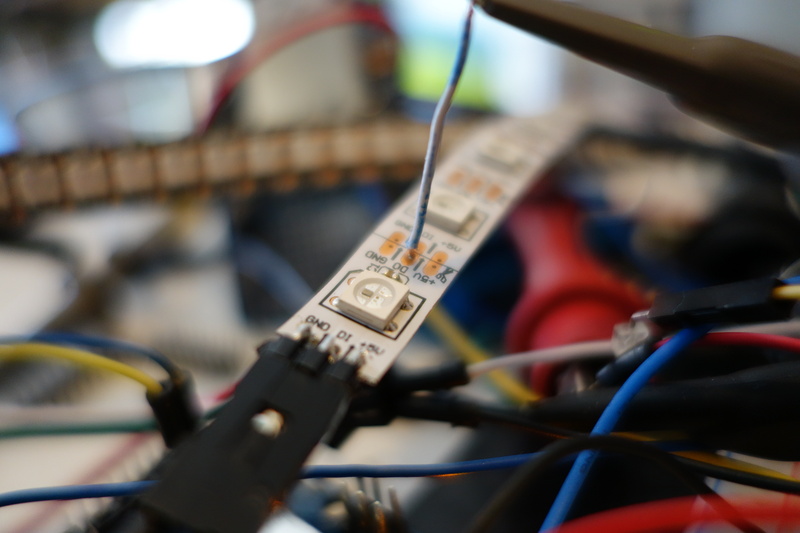 One of the things that makes NeoPixels so useful is that you can connect huge numbers of them end to end and they will faithfully relay your data on down the line. According to the Englishish datasheet, “Built-in signal reshaping circuit, after wave reshaping to the next driver, ensure wave-form distortion not accumulate”. I’ve placed a wiretap on the trace that connects the data-out from the near NeoPixel to the data-in of the far one. 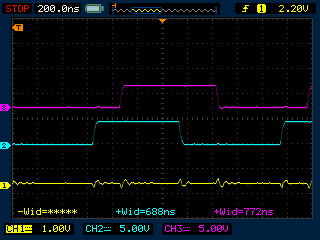 Here an out-of-spec 186ns 0-bit runt gets stretched into lovely in-spec 386ns 0-bit. Here an out-of-spec 560ns 0-bit whale gets compressed down into lovely in-spec 376ns 0-bit. 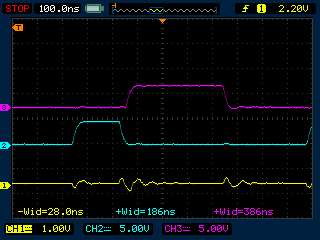 …here changing an in-spec 434ns o-bit into an “ideal” 380ms. 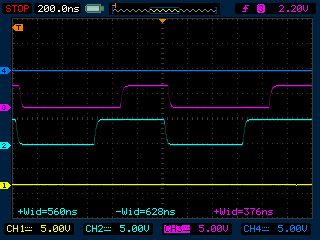 A short 688ns 1-bit getting stretched into an “ideal” 772ns 1-bit. 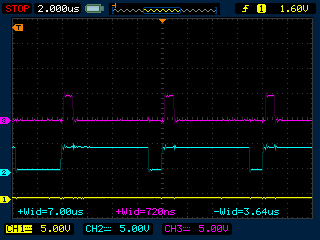 …and a long 872ns 1-bit getting squeezed down to a 768ns 1-bit. 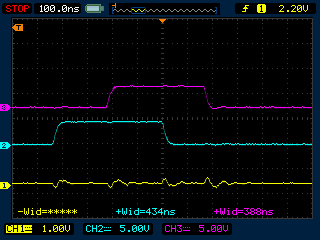 Looks like this pixel’s dream 1-bit is about 770ns long. It’s that simple. Anytime any bit is detected, it gets retransmitted as an “ideal” bit. 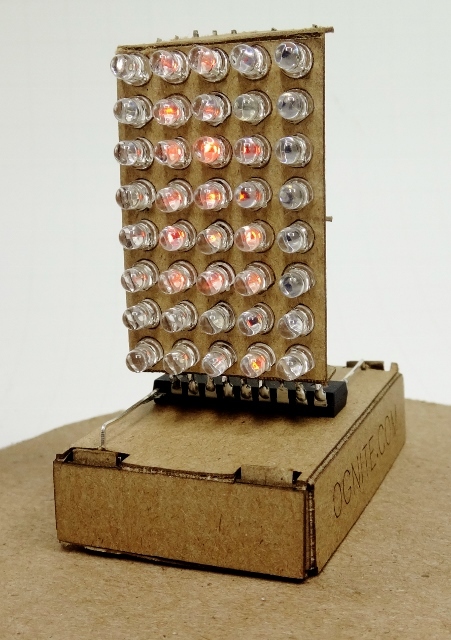 Like people, each NeoPixel has its own concept of what “ideal” means, and it can change over time. Generally all NeoPixel’s ideal widths will fit within the spec, but there is plenty of room for variation. Neopixel telephone game with really long 1-bitsThe bottom blue trace shows the (very long) 1-bit coming in just fine, but the purple trace shows that ~6ns later, it is spitting out a perfectly proportioned 720ns long 1-bit to the next pixel in the line. Here, a 7,000ns 1-bit is reshaped to a 720ns 1-bit followed by 6,280ns gap. The long 1-bit is thereby converted into a normal 1-bit followed by a reset. This is what defines the practical maximum length of a 1-bit in a string. Conversely, in the case of bit that the current pixel sees as too short, it will widen it and that will use up some of the gap before the next pixel. When a chip with an “ideal” 1-bit that is on the high end of the spectrum meets a long chain of short 1-bits, you can imagine that the stretching 1-bits could eventually use up enough of the gap that it would be less than the required minimum and you’d get a overrun. I think it is counter-intuitive that a chain of short bits could cause an overrun, but it is really the downstream elongated bits that cause the overrun because they are intruding into the gap. Got that? No? Well the take away message is….